cardigans and kids: summer goals & bagels. 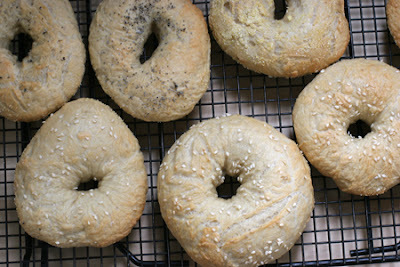 The bagels are yum. 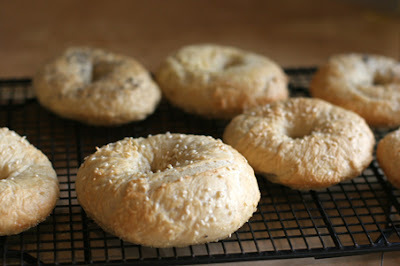 I based my bagels off of Scratch Baking Companies "Baker's Notes". Scratch Baking Company is a bakery in Portland, Maine. I first heard about them over at 3191 from MAV. (Incidentally, I wrote this post while baking the no flour peanut butter cookies-great with my morning coffee. I did not have a starter and we will be in and out for a bit more over the next weeks so I don't have time to start one, so I used the recipe from "5 Minutes to Artisan Breads" and then had some trial and error finding the best times for the boiling and the baking times. I boiled less as recommended by Scratch and baked at the higher heat but less time and no turning - a mix of both. I made of the dough and then saved part of it to work with the next day. This was a really good thing because when I should have been checking the first batch the puppy had had an accident that distracted me and they were too done. The second were pretty close to right on. 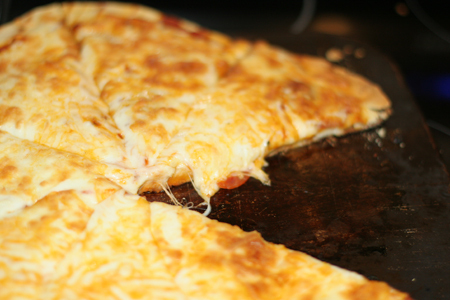 Some of our grilled pizza. I can not take all the credit for these though, Matheau ran the grill. He has some mad grill skills and they were amazing.